ScopeView is used for signal visualization, data analysis and monitoring. In both real-time and offline modes, ScopeView displays, analyzes and compares waveforms acquired from various environments, data acquisition systems and field equipment. Scopeview is an ideal tool for engineers needing to perform mathematical and electrical calculations, conduct post-processing analysis and produce reports. ScopeView lets the user focus solely on results, not on writing complex scripts for viewing data. In addition, ScopeView is available with all our solutions HYPERSIM®, eMEGASIM, eFPGASIM and ePHASORSIM. ScopeView enables users to more quickly create, load and save custom templates to help consolidate data, compare results and repeat tests. 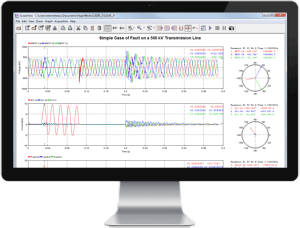 Optimized for the power system engineer’s typical workflow, ScopeView behaves like a virtual oscilloscope and spectral analyzer for at-a-glance indications of real-time and offline simulation system performance. For additional convenience, data can also be imported from and exported to a wide variety of formats (MATLAB, CSV, COMTRADE, etc.). 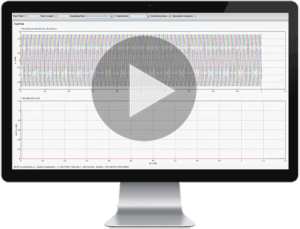 ScopeView features enable performance of advanced signal processing, mathematical calculations and analysis. ScopeView interacts with the simulation process through the initiation of disturbance sequences through circuit breaker switching operations. While delivering data with the highest level of accuracy and detail, ScopeView enables sorting of results to obtain relevant and precise analysis. In addition to the templates and layouts available to simplify the reporting process, ScopeView also includes graphical manipulation tools to improve the user’s visualization experience. Reports and results can be quickly exported in any format and efficiently shared with other colleagues or departments. ScopeView is easy to use and offer dozens of built-in functions to accelerate graph generation. All operations are also performed using a standard mouse, allowing for a quick learning curve.